For families of premature babies, the first few weeks and months of life can be extremely stressful. The expert care of the staff in the NICU means that your child is in the best possible hands while in the hospital but how should you care for them when it is time to bring them home from the hospital? What sort of issues, ailments, and developmental milestones (or delays) should you be aware? As part of NICU Awareness Month, we would like to provide support to NICU parents by discussing preemie care after the NICU. 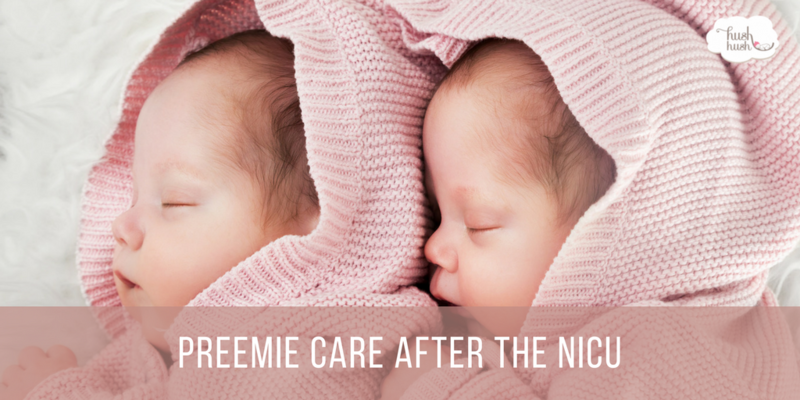 One of the best things you can do regarding preemie care after bringing your baby home is to spend time with your baby skin to skin on your chest. Holding your preemie in this position is known as Kangaroo Care and has been shown to increase intimacy and bonding between parent and child. Additionally, according to the American Pregnancy Association, a mother’s body has been shown to adjust its temperature to meet their baby’s temperature needs during Kangaroo Care. The regulation of body temperature in this position can lead to deeper sleep and allows their energy to be used for other bodily functions. Ultimately, the improved sleep and energy conservation typically leads to improved development and weight gain which are vital for premature babies. When discussing a premature baby’s developmental progress, it is critical for parents to be aware of the concept of adjusted age. Essentially, adjusted age is calculated by subtracting the number of weeks they were born early from their age. For example, a 24-week old baby who was born six weeks early would have an adjusted age of 18 weeks and should be on track with the developments for an 18-week old baby. Many parents get concerned about this aspect of preemie care. According to healthychildren.org, the most crucial thing to look for is a progression such as responding to sound then following familiar voices and eventually responding to their name. However, if you think something is off, never be afraid to use the resources at your disposal. The final aspect of preemie care after the NICU that we will cover deals with the case where you have to bring home equipment for your child. One of the most common devices that premature babies may need is an apnea monitor which tracks the breathing and heart rate of your sleeping baby. An alarm goes off if your baby stops breathing briefly or if their heart rate is unusually slow. You may also require an oxygen monitor to ensure proper oxygenation of your child’s blood. At Hush Hush Little Baby, we have Newborn Care Specialists who specialize in premature babies and would love to work with you and your family to provide peace of mind throughout the day or night.